Today's lesson in class makes you think about your time in the mountain. At first, you thought it was an unfortunate thing to be staying in the mountain when everything's lively in the city. However, hating it never came to your mind. Sure, sometimes you wish to be back in the security of the city away from the tension in the hinterlands. But it seems like nothing can replace the peace you feel everyday having to be so close to nature. You begin to enjoy every bit of your time there and generosity never becomes a problem. Then one day, you have to face reality. You're called to serve the city and your vacation during work ends. But everyday, you pass by the mountain you once lived in. And it makes you want to visit it once more. So you did. You can't really memorize the roads there but you believe you'll be able to reach the location you're dreaming of. Then again, the beautiful valley stuns you every time. This time, you just have to admire it to the fullest. You spend half an hour taking in the view and decide to continue your journey. But you can't remember the way back to the road. 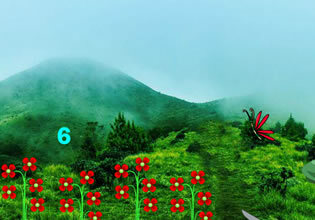 Play Green Mountain Valley Escape outdoor escape game by Games 2 Rule.